Sweeter than Birdsong is a new novel that combines hope and faith to create a fantastic historical fiction read. Sweeter than Birdsong is the second book in The Saddler's Legacy by Rosslyn Elliot. This is the first book I have read by Rosslyn Elliot but I was so pleased with it I am planning to go back and read Fairer than Morning, the first book in this series. This book really focuses around two main characters Kate Winter and Ben Hanby. Kate is a very shy yet beautiful college student. She is the first woman to graduate from Otterbein College and she has many dreams to persue. Mainly she wants to be able to escape from her family's secrets and her overbearing mother. Ben Hanby is a musical genius at Otterbein College and the director of the musical. When he hears Kate sing he is mesmerized by her voice, beauty and shyness. Ben is interested in getting to know her but know he must keep some of his secrets to himself as well. Mainly his work with The Underground Railroad no one can know about. In the book Ben and Kate are brought together by a terrible tragedy. This accident threatens to expose both of their secrets as well as ruin their dreams. Throughout the book they develop a relationship that grows in trust and strength from God. The was a beautifully written Civil War novel. In the past I have not been one who has really enjoyed Historical Fiction books. 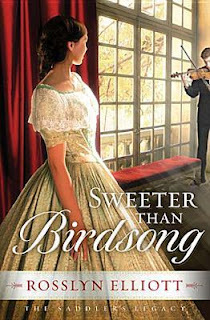 Sweeter than Birdsong ws so descriptive and well written that I actually felt like I was a part of the book. If every Historical Fiction book was as well written as this I think I would really enjoy the genre. I was provided a copy of this book from Book Sneeze and Thomas Nelson Publishing in exchange for my honest review.